It all starts off with a quest for a berth (read that as ‘birth’) on this train. It is not that easy to secure that berth. There is always a large number of passengers eager to get on the train and reservations for that journey begin much before the actual date of journey! So much so that when one gets a confirmed ticket, one is literally overjoyed. Ticketless traveling is a strict no-no and those that do not get a confirmed ticket can try for the ‘next train’ (read as ‘another lifetime’) or get into the ‘waiting list’ hoping that somebody will hop out of the reservations so that they can hop in. Just a minute please. What is this ‘waiting list’? Well, you see, there are some who are considered special by society – ministers, educationists, administrators, rulers – and therefore have ‘reserved berths’ on the train. Only if they choose not to travel will these berths be released to the ‘common man’. Those who wish to get onto the train via such berths constitute a waiting list! Such reservations are made for beings who have done so much good that society pays its gratitude to them via these berths. Well, being ‘good’ and ‘noble’ might not be a prerequisite when it comes to the normal trains but that rule is strictly adhered to when it comes to the train of life. And ‘nobility’ and ‘goodness’ are determined by deeds and not by birth! All the pains and pleasures man experiences are the results of his own actions and not due to any act of the Divine. Having secured a berth on the train, let us take a stroll through its entire length. One thing that immediately becomes clear within the train is that there are ‘upper’ berths, ‘middle’ berths and ‘lower’ berths. It would be highly foolish to think that an ‘upper’ berth indicates superiority over the ‘middle’ or ‘lower’ berths. In fact, statistics show that during reservations, many passengers pick a ‘lower’ berth in spite of its lowly name because it is definitely more comfortable in context of the entire train journey! (Think of Mother Kunti requesting Lord Krishna for a life filled with suffering so that the Lord always remains in her being.) It is only the kids that seem to like the upper berths for they can jump and frolic there, feeling superior to those sitting ‘below’. Well, you can’t help that; kids are immature. The point is that the berth one has - ‘upper’, ‘middle’ or ‘lower’ - is only indicative of one’s ‘elevation’ in the train. It has nothing to do with the journey – all berths are headed towards the same destination anyway and unless one chooses to get off the train in between, one is sure to reach the goal irrespective of the ‘height’ of the berth. Another thing that slowly becomes clear as we walk the train is that there are sections of the train that are much more luxurious that the other. These sections offer better facilities and greater comforts during the journey. Why this discrimination? Call it karma if you please but those people in these sections of the train paid greater ‘amounts’ (read as ‘good deeds’) during the reservation. The difference in one’s bank balances is what creates the difference on board too. That should be strong motivation for all to ‘earn’ more. But the wise realize that the luxury is no big deal because, as was with the case of the upper and lower berths, all the ‘classes’ of compartments too are headed to the same destination. Irrespective of the bank balance, one has to travel the entire journey anyway. So, though a healthy bank balance (of good deeds) can make the journey comfortable, one can do the journey even without it. Traveling light is another way of making the journey comfortable! Of course, one needs to carry necessary luggage and baggage. But it would be best to keep it to the minimum necessities. Anything else only adds to the burden during the travel. Do not cultivate excessive desires. “Less luggage, more comfort makes travel a pleasure.” Hence, reduce the luggage of your desires. It is natural for people to have some desires, but one has to enquire which one of those desires is good for one and which causes harm. Unfortunately, this sense of discrimination is lost in present times. All these desires, which are the result of kama, krodha, lobha, moha, mada, and matsarya (desire, anger, greed, delusion, pride and envy), have their origin in the mind. One’s destin(y)ation has been decided before one even boards the train and it is clearly printed on the ticket. So, it is pretty obvious that one can ‘break’ the journey at any station and choose to book a new berth on another train to reach the ultimate destination. Any number of such breaks can be taken – only that, the time in reaching the destination gets delayed. Just think how foolish it would be to simply keep drifting between the different stations, up and down, without actually moving closer to the destination? Again, that is something that only the ‘kids’ might enjoy, not those that have ‘grown-up’! More foolish than ‘breaking’ the journey by getting off at stations in-between, pulling the ‘emergency’ chain. No wonder that this ‘suicidal’ action has been considered a crime! Man alone has the chance to liberate himself from the wheel of birth and death, through the pleasant means of serving God. But as a result of ignorance, or what is worse, perversity, he lets the opportunity slip from his hands, and suffers grief and pain, fear and anxiety, ad infinitum. The TC can move a passenger from a ‘lower’ to a ‘higher’ berth or from a ‘normal’ to ‘luxury’ class based on the needs. Note the term used - ‘needs’ - not the wishes of the passengers for the TC knows best. He can also tell the ticketless passengers to get off and board a train only when they have a legal ticket. He definitely fines the offenders and ensures discipline on the whole train. The TC has no need to travel in the train but he does so to ensure that the passengers are safe and happy and that there is no nonsense going on in the train. If the TC is your friend, you can rest assured that your journey is going to be smooth. 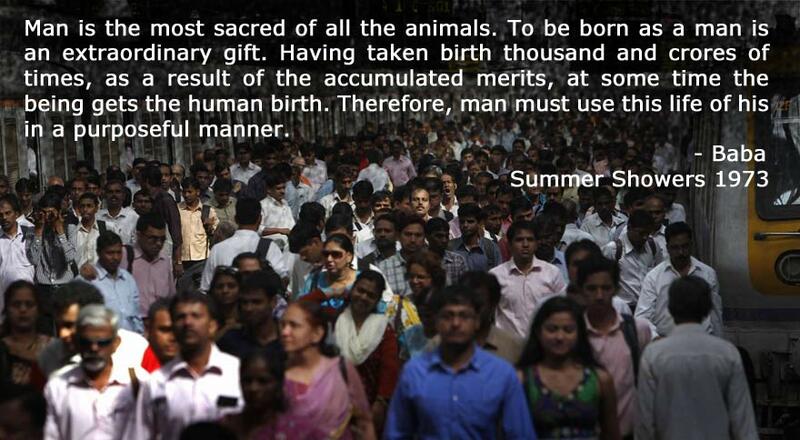 Human life is a train journey indeed! 1) Jnana is the through-train; you have to just board it, that is enough; it takes you directly to the destination. 2) Bhakti is the through-carriage train; though it may be detached from one train and connected with another, if you get into it, you need not worry; so long as you stick to your place, it is bound to take you to the destination. 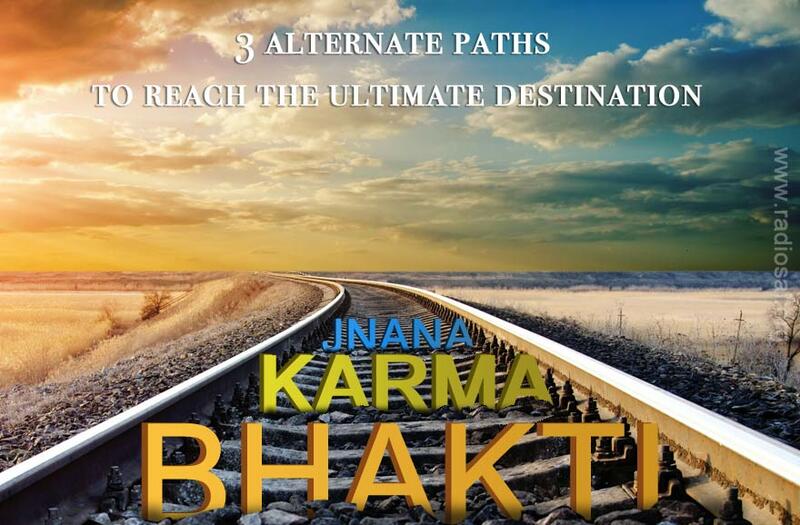 3) Karma is the ordinary train; if you board it, you have to disembark, climb in and climb out at every junction from one train to next, load your luggage and unload it, and do a laborious work to reach your destination. 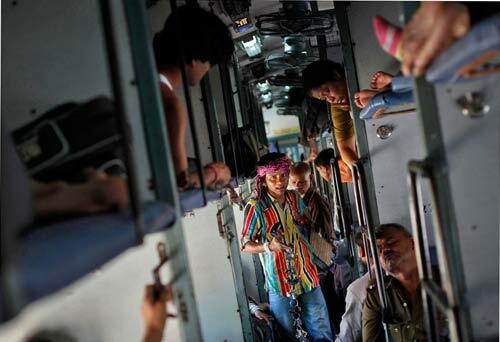 You have a ticket for Calcutta but you are travelling in the train headed for Bombay! With the body which is your ticket, Vijnana, and Vairagyam (world knowledge and detachment) as your luggage, you are travelling not in the train which goes Godward but in the train leading to Prakrithi (objective world). This is the pity! Develop a love for God, then you can recognise Him very near you, in your own Self. That is the assurance I am giving to all of you. The convocation drama presented by the students of Sri Sathya Sai Institute of Higher Learning on November 22, 2012 incidentally was based on this theme, and it was portrayed powerfully by the students.